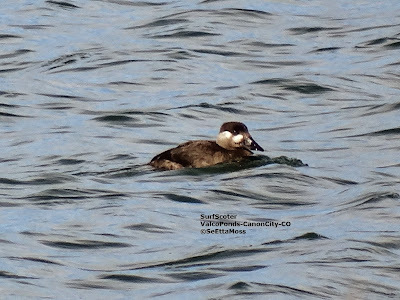 Yesterday I photographed this Surf Scoter that was found the day before on a small private reservoir called Valco Ponds along with good numbers of common waterfowl and several Grebes. I got this shot without trespassing on this private property by standing on the large cement blocks by the vehicle gate to get a clear view of the bird as it swam past about a hundred feet away. 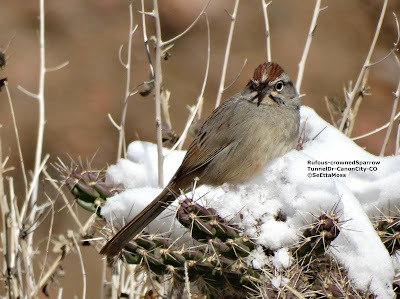 Rufous-crowned Sparrows were first discovered about 15 years ago at the Tunnel Drive area of Canon City during a Christmas Bird Count by birder Dave Johnson. They have been seen in this area every year (rarely seen during June and July when I speculate they go up into the higher side canyons in this area for nesting) and are the most northern residents of this species in Colorado. believe I saw two of them together yesterday and believe they were likely a pair as Birds of North America online notes that pairs in California "are paired throughout the winter." This is one of the few times I have seen them without Canyon Towhees nearby. 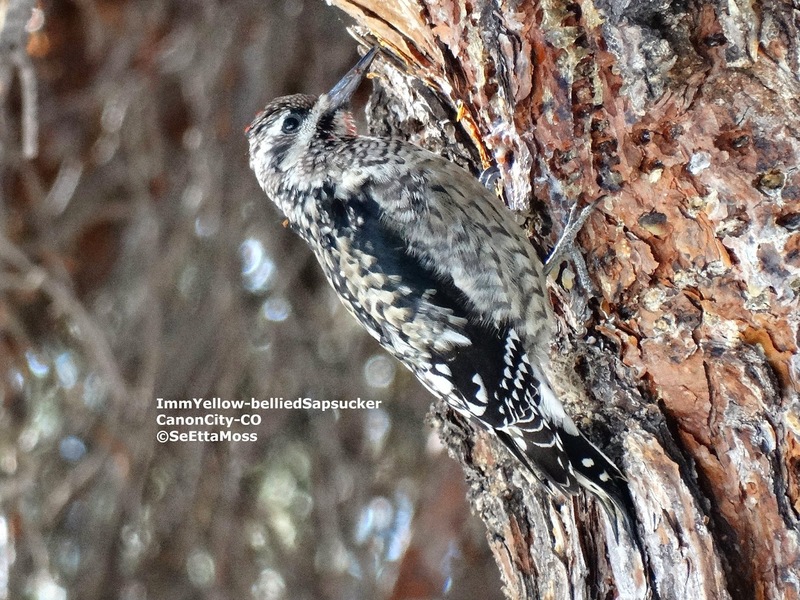 I have not refound the adult Yellow-bellied Sapsucker I posted about earlier this month and only 1 of the 6 Williamson's Sapsuckers earlier this week but yesterday I found an immature Yellow-bellied and an adult male Red-naped Sapsucker in Canon City. I suspect that the severe Arctic storm that dropped temps here to below freezing for 3 days has impacted the sapsuckers as the bark and possibly inner portions of the trees on which they feed have likely frozen. Though it has warmed here it is still a challenge for them as I have seen the Williamson's feeding on a deciduous tree and low to the ground where the sun was on that part of the and the Yellow-bellied feeding very low on a pine in a portion where they sun was hitting it.